wheelchair bound, got married…I found this video about them and their wedding to be incredibly sweet and moving (English translation of the video is below). -A shot of Shaul’s wheelchair decorated in white taffeta (58 seconds). Groom’s father: I always believed that whatever Shaul wanted could truly come true. Narrator: A few months ago we visited him at his home at Kibbutz Sdeh Eliyahu, and we discovered a person for whom the sky’s the limit. Shaul Anvari was born with cerebral palsy but he never allowed his handicap to get in his way. With a lot of faith and determination, he managed to become an ordained rabbi, and even wrote a book about Jewish law’s approach to the handicapped and disabled. This time, we returned to his home in order to accompany him as he ascends an additional peak, which is apparently the highest of all, when he proved to the world that for him, even the sky is not the limit. he is actually getting married. The Holy One Blessed be He has an ordered plan; we are a small screw in His plan. Shaul’s mother: At his core, Shaul is an optimist, a big optimist. And he shines that goodness that is within him to his whole environment. And therefore he has acquired many friends. And in the end he found a bride. They are really like 2 twins, spiritual twins. It is so wonderful and beautiful to see the connection between them. Shaul’s sister: I think he is an example for all of us, of great determination. He decides something and sets a goal, and it is achieved. I am very happy and very excited for him. Very much so. Shaul’s other sister: I admit that I was a partner in this, since we spoke a lot about this, and we discussed the ideas together, and what could we do to find Shaul a wife and to have a good life. It gives a lot of strength. Shaul’s father: Baruch Hashem, Shaul has many good friends. They help him, and they are with him all the time. Volunteer from the “House of Wheels” [a center for handicapped young adults]: You understand that Shaul volunteers at the House of Wheels. And the difference between the volunteers and the participants is that we, thank G-d, have working arms and legs. But on a cognitive level, in terms of personality, the handicapped participants are like us, and are greater than us. Rabbi at the chuppah: You have a special spirit. A spirit that enables you to overcome. A spirit of love of Torah. A spirit of love of mitzvot. A spirit of heroism. Another rabbi at chuppah: How much love we’ve learned from you. How much love you have given us. And with wondrous skill, I think you have drawn out of all of us a great deal of love. And for this, we owe you a big, big thank you. Shaul’s father: The whole time, I had tears in my eyes, and sometimes they also flowed out. The truth is that it was so powerful to see the number of friends that both Shaul and Neta have gathered in their life; it is incredible. Rabbi from the chuppah: Shaul is like a magnet, he gathers friends in his life. A magnet of love. Baruch Hashem that I was able to see such a beautiful thing ! My eyes are full of happiness ,so full they over flow! That his family stayed by his side and supported him is beyond moving . How blessed are those born to a Jewish family! The whole community is your family!There is nothing better in this life than to be loved and supported by the Jewish community! Wow. Yes, we are all tiny screws in Hashem’s immense universe, but Shaul and Neta are hefty hammers, knocking on all of our collective conscience to get with the program. 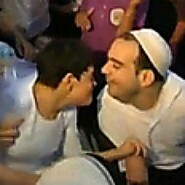 Mazal Tov. thank you for posting this! truly heartwarming and inspiring. may we all only know of simchas and each of us find our bashert. i had tears running down my face the whole way through. truly amazing and wonderful. Me too, I cried throughout the whole thing. It was so beautiful and touching. A beautiful, moving video. Thank you for sharing it – it gives us a way to ‘participate’ in a special simcha – ken yirbu. Does anyone know where the wedding took place? It looked to me a little like Sde Eliyahu. Possible? Thank you so much for sharing this and helping us understand that everyone deserves and should strive for love and fullness and that we are ALL (very small) parts of Hashem’s greater plan! Wow non stop tears. Really, really beautiful!! I met him when I was living in his kiboutz, I lived in Sde Eliahou for five years. It was a formidable experience for me, and I’m not so surprised that that they found a kala for Shaoul. I’m very happy for them.